As someone who has recently looked at a lot of Tuska art, I concur with your assesment of the two stories. They look like Tuska art to me. Around that time, Tuska was also doing Buck Rogers, which can be seen at my blog these weeks. It’s too bad that Tuska never did more for Sick than he did. Now that I mention sick, we should really get together on doing a series on Sick after I return from my honeymoon. Or maybe I could start a Sick series on my own, have you add to it… I think this magazine waarants a closer look as a Simon creation. he did not draw a lot for it (though more than for any of his previous efforts of the years before that), but he sat in on the writer’s conferences and devoted a large aprt of his life to it. Two unrelated comments: 1. I agree that your Tuska attributions are right on the money. 2. 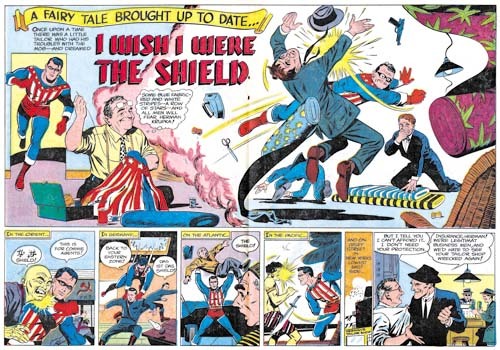 It’s interesting that Archie in its Red Circle incarnation brought back both “Private Strong” and the original Shield, though the Simon & Kirby character was soon dropped. I wonder what part, if any, the rumored threat of a lawsuit had in the decision to again discontinue the character. I agree with your Tuska attributions also. 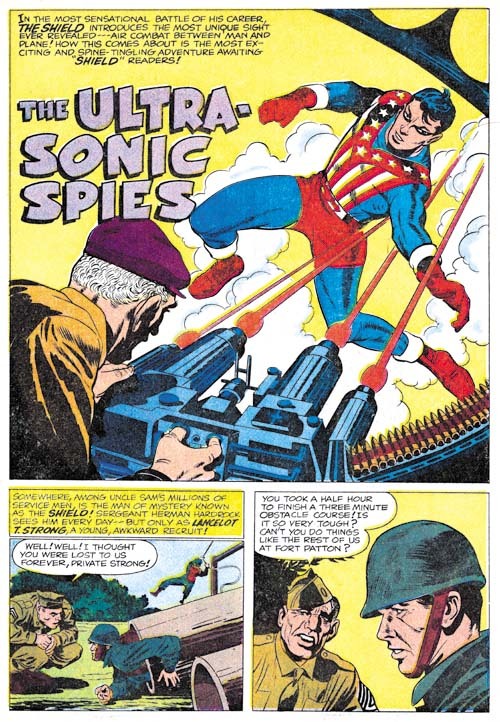 I notice on your entry about the “Ultra-Sonic Spies” story that you credit “Art by Jack Kirby”. Usually when you do this, I believe you are crediting Jack with the pencils and inks? 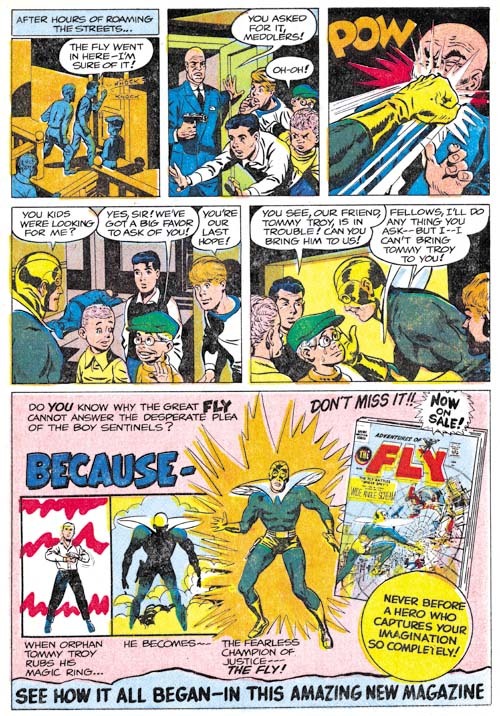 This story is defintely penciled by Jack, and much of the inking looks like him as well, but there sure are some inking anomalies! 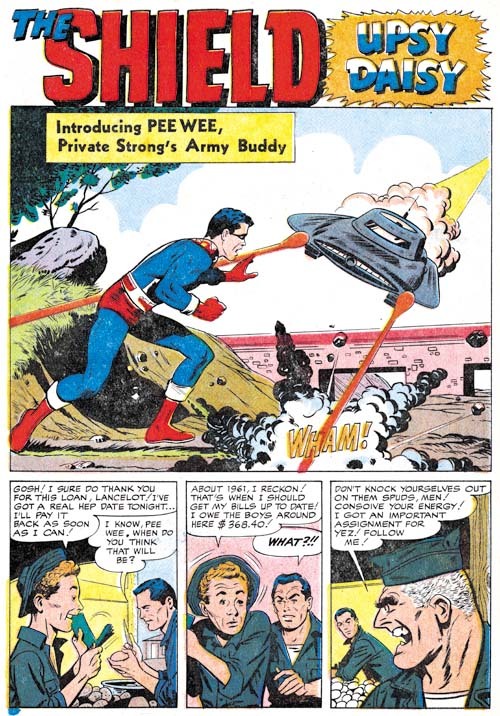 Check out the inking on the soldier in the foreground of the last panel on page 1. Reserve me a place in the funny farm, but that inking reminds me of Reed Crandall. Pages 2 and 3 look predominently like Kirby inks to me. Pages 4 and 5 do too, except for a lot of fine pen inking lines that don’t seem to fit the Kirby bill to me. On the final page (6)you see a lot of these fine pen inking lines again, and the face of PVT. Strong in panel 5 sure looks strange! Part of the allure of these oddball Kirby projects is the mystery of such things to me! 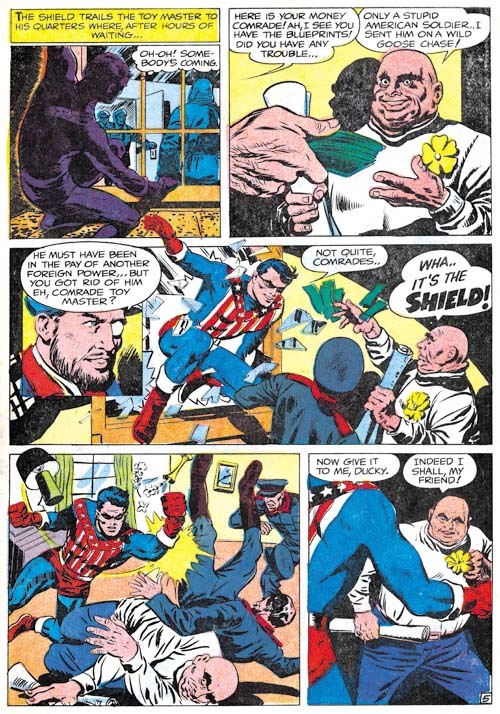 Thanks to all about your opinions about George Tuska being the correct attribution. Let’s see what happens when I move on to the first couple of Fly issues. I must apolgize about my use of the term “art by”. When I first adopted its use it was to mean that both pencils and inks were done by that artist, just like you wrote. However in more recent times I have become rather sloppy in my terminology. Frankly my current projects have made it impossible to find enough time to adequately research inking attributions. So generally I avoid assigning inking credits. But I am going to return to a more precise terminology and reserve “art by” to cases covering both pencils and inks by the same artist. Because of my time restrictions I will not be trying to identify the inking for Private Strong or the Fly. But although it sometimes takes time to come up with a proper inking credit it sometimes it is not hard at all to say who did not do the inking. In the case of the Shield and the Fly I think I can pretty confidently say that Jack Kirby did not do any of the inking. Joe Simon tells a story about how the inking of one of his project was done. However I do not feel it would be right for me to repeat that story. The story comes up when we talk about another Simon comic however I have come to believe it might actually concern the Archie superheroes. If I’m right then your spotting Reed Crandall may not be so crazy. Hopefully Joe will include the story in the upcoming autobiography.